Tripp Lite introduces it's new OM4 Laser-Optimized Multimode Fiber (LOMMF) "Aqua" cables, for use with 40/100Gb Ethernet applications. 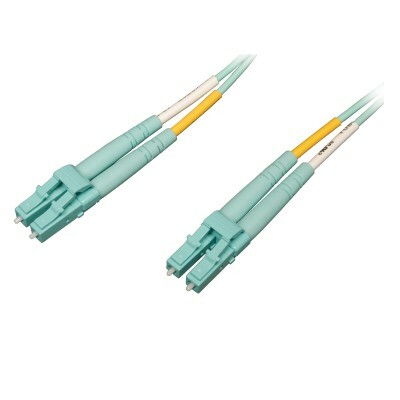 These new technology, 50/125um, LC/LC Fiber Optic cables, provide nearly ten times the bandwidth over conventional 62.5um multimode fiber, with performance rivaling that of Singlemode cable, at a much reduced cost. LOMMF cable allows 40/100Gb serial transmission over extended distances in the 850nm wavelength window, where low-cost Vertical Cavity Surface Emitting Lasers (VCSELs) enable a cost-effective, high-bandwidth solution. LOMMF is ideally suited for LAN's, SAN's, and high-speed parallel interconnects for head-ends, central offices, and data centers.